Oklahoma congressmen who were aboard an Amtrak train when it crashed into a garbage truck near Charlottesville, Virginia on Wednesday escaped serious injury. The driver of the truck died later from his injuries despite the efforts of congressmen who are also medical professionals. Sen. James Lankford and Representatives Tom Cole, Steve Russell and Frank Lucas were aboard the train at the time of the collision. They were among a large number of Republican members of the Senate and House who were headed to a post-state of the union address retreat at the Greenbrier in White Sulphur Springs, West Virginia. Sen. Lankford quickly tweeted details of the crash and the response by some members of Congress. 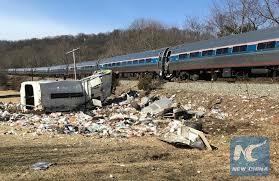 “Our train heading to the GOP Retreat in West Virginia has been involved in an accident. I am safe but first responders are treating minor injuries on the train & treating the truck drivers. Praying….”tweeted the Senator. He later explained more about the crash. “It was pretty amazing. The first responders were really the member doctors who were demanding to get off the train. Security was concerned because it looked like there might be gas leakage. They were concerned there could be an explosion. There wasn’t, as it turned out. But fortunately, a lot of doctors that are members in both chambers. Michael Burgess from Texas, Roger Marshall from Kansas, Senator Bill Cassidy from Louisiana,” wrote the Senator. He went on to indicate other details. “They actually were the first people on the scene as far as I could tell… they managed to get out on their own. They were the first ones rendering assistance. Then you pretty quickly had emergency first responders, paramedics, a lot of fire vehicles and balances here now. But yeah, they were administering CPR to the folks that had been hurt in the crash,” said the Senator. Rep. Tom Cole was also on the train then later spoke with CNN, describing what happened. Sen. Jim Inhofe was not on the train but tweeted an early response to the tragedy. Rep. Markwayne Mullin was also not on the train. The retreat was intended to feature Vice President Mike Pence Wednesday evening and President Trump on Thursday.